Parish priests, school principals and vice-principals were invited to attend a special session during the celebration of Catholic Education Week. On Friday May 5, the trustees and administration of the Renfrew County Catholic District School Board hosted an “In Conversation” luncheon meeting at St. James the Less Church Hall in Eganville. In his opening remarks, Dave Howard, Board Chair, thanked everyone for attending and noted that one main purpose of the meeting was to show appreciation to the clergy. Howard noted that the date of the meeting was chosen specifically to coincide with Catholic Education Week, and the spirit of this year’s theme, Walking Forward Together. “It is important to go forward with a united front, prepared to defend our Catholic faith and Catholic education with a strong voice,” added Howard. Jaimie Perry, Superintendent of Educational Services, presented the 2017–22 RCCDSB Strategic Plan, explaining the extensive process, including the input of approximately 800 people into its development. 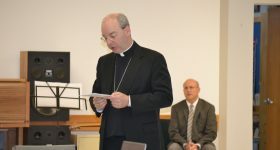 “The simple one-page plan is supported by rich language that animates who we are as a Catholic community,” noted Perry. Following the presentation, attendees broke into groups for an “In Conversation” exercise. Four questions were posed to the groups to initiate dialogue around improving communications and relationships amongst members of the Catholic community, the roles of Catholic schools in society and how church and school can work together to meet shared goals, as well as ways to work together in a united front for the benefit of parents, church and school. “This day is to help make certain that we are going forward in the right direction and in a positive manner,” summed up Howard.